The OOH media with the highest reach! Selvel-NEXT has introduced a new concept of Bus branding with Audio + outdoor integration – an exclusive audio channel in these buses. Advertising in today’s world is getting a facelift with relevance-based communication. We understand ‘awareness’ is a very important aspect in marketing that needs to be timed and placed well. We have achieved exactly this by associating with Volvo buses across Kolkata & introducing a GPS triggered device that can be programmed to play ads at the right location. An android-based application will be installed in the phone which will be the medium for playing a range of music genres. 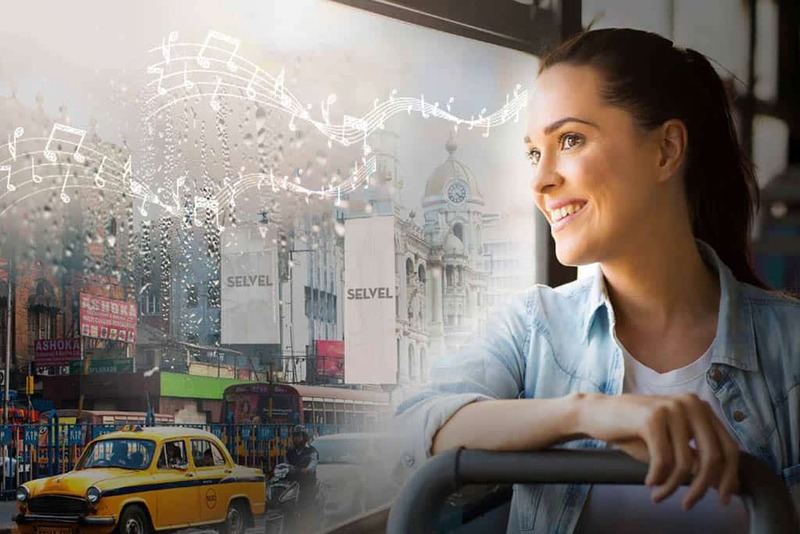 The buses shall entertain the passengers with essentially mood-mapped music and provide important information all day long. With a reach of over 80,00,000 people, there is no better way to capture the audience in the bus. Location based GPS triggered connectivity. Time & location specific Ads to capture the right target group. Client Led updates like weather, traffic, gold rates, astrology etc.